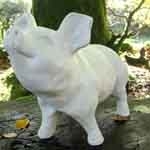 We have a wide range of resin lifelike wide life animals. Each one of our animal ornaments are made from high quality resin and are UV and frost proof too. Great additional to anyone's garden and home. Wonderful as a gift.